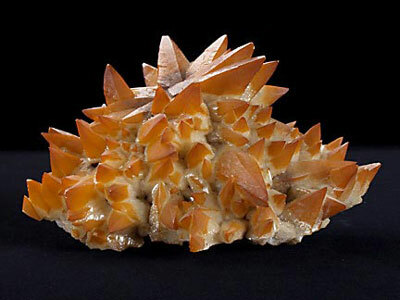 Calcite is one of the most common minerals on earth and makes up the rock known as limestone. However, large, colored crystals like this one are much rarer and usually form in water-rich environments beneath the surface of the earth. The yellowish-red color of these crystals indicates that some strontium has substituted for calcium in the microcrystalline structure of the sample. Calcite is extremely delicate and is easily destroyed by acids.